This is far more important than you might first think as one thing I learned very quickly photographing weddings down here in Cancun and Riviera Maya was that how important the bride’s hair was to the success of the photographs. The other thing I noticed very quickly was that brides were completely unaware of this and were all making a very similar mistake. 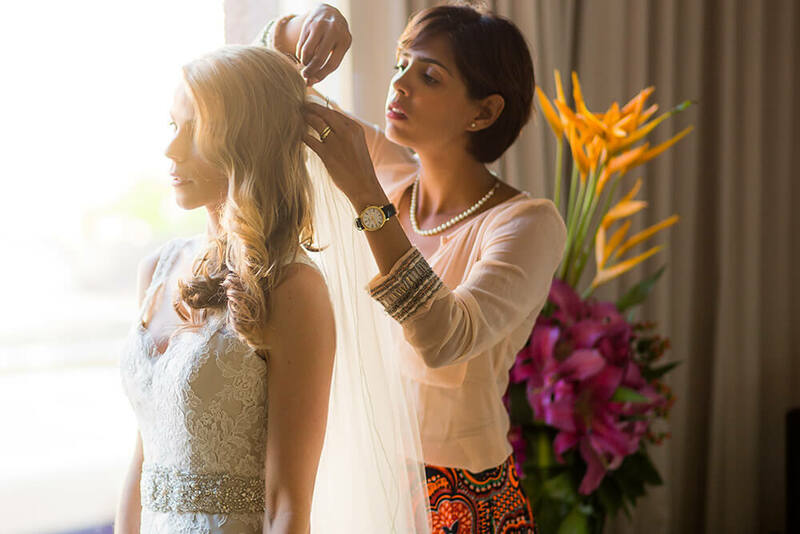 Here are the things I think you should consider when choosing how to wear your hair for your wedding. To complicate things even further, the breeze comes from the sea onto land, meaning that if you have dreams of the beautiful blue colors of the Caribbean Sea in the background of your photographs, your hair needs to be up or under control so that it isn’t blowing in your face. And please don’t forget about the groom! Obviously, the wind will have the exact same effect on the groom’s hair as well. So if the groom has longer hair, please make sure you have a plan on how you can keep under control in the wind. It is very humid here in Cancun and the Riviera Maya and if you have long hair it might do some pretty funky things here. It also means that you may have a difficult time getting curls to stay in your hair, and you will likely have to use about 3 times the amount of hairspray. If you have your hair up or under control, then this is usually not a problem. The only time I have seen issues with this is when a bride has long straight or wavy hair and wants to wear it down with curls. With the combination of wind and humidity, I’m sorry today that I’ve seldom seen this plan work out well. Bring LOTS of hairspray! And when I say lots, I mean 2-3 times as much as you would normally bring. And get the high humidity type. And please tell your family (especially mothers) and friends (bridesmaids) about the wind and humidity so that they too can be prepared. If you have hired a professional hairstylist, they will be prepared and aware of the wind and humidity. My only suggestion is that you collect a few photographs of the hairstyle you want and bring those with you saved on your phone so that you can show them exactly what you want. Please pin your veil. I can’t tell you how many times I’ve heard a hairstylist say that the veil does not need to be pinned through the comb. But I can tell you that most of the time, if the veil is not pinned it, it will come out either as you are walking down the aisle or shortly after. Pinning a veil is very simple. All you need to do is put two bobby pins in the comb of your veil so it grabs some hair. It’s super easy to do and will not damage your hair going in or coming out. Please do not rely on Photoshop to fix your hair. The most difficult thing to correct in Photoshop is hair and often there is nothing that can be done. Removing the odd stray hair here or there as this is often easy, but when it comes to trying to correct large amounts of hair blowing in the wind is nearly impossible so please do not rely on your wedding photographer. I hope you have found this advice helpful and productive. 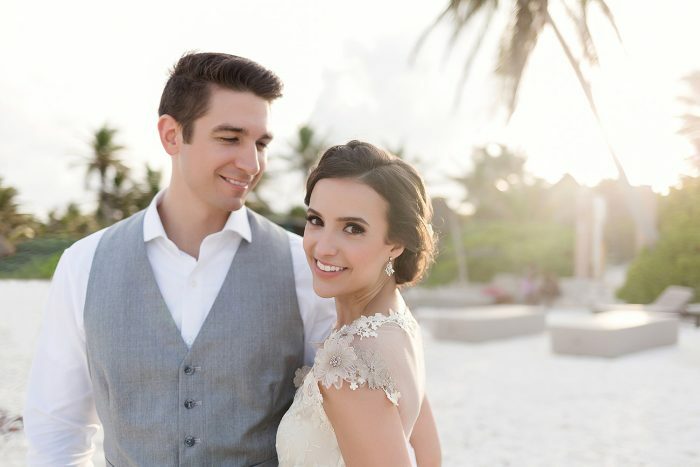 My goal is that you have a wonderful wedding here in Cancun and the Riviera Maya and I hope that this article helps you not make some simple, but tragic mistakes with your hair. And if you have any questions please email me at info@deansandersonweddings.com and I will be more than happy to help. Enjoy and I hope I get to see you at your wedding!